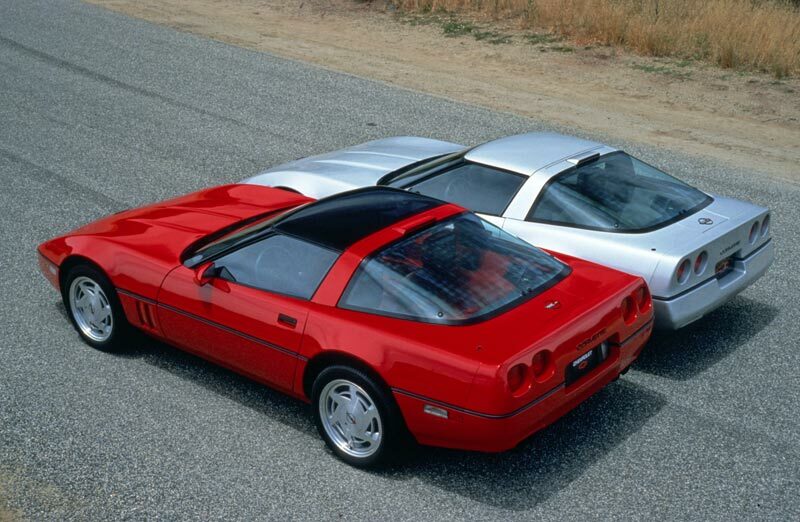 The ZR-1 was available in coupe form only. 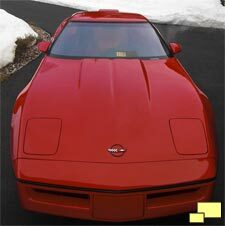 There are rumors however of special ZR-1 convertibles constructed for top GM executives. 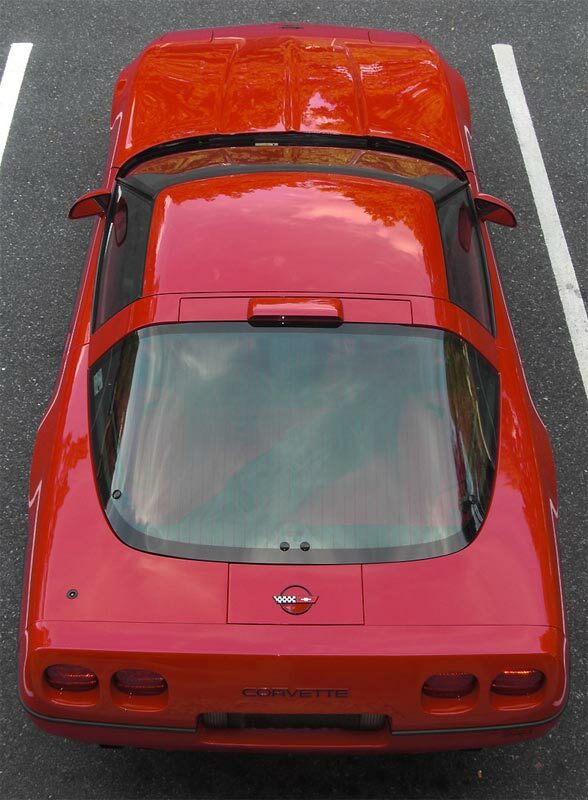 Above: The 1990 ZR-1 benefited from distinctive styling from the rear in the form of a convex as opposed to concave bumper shape. 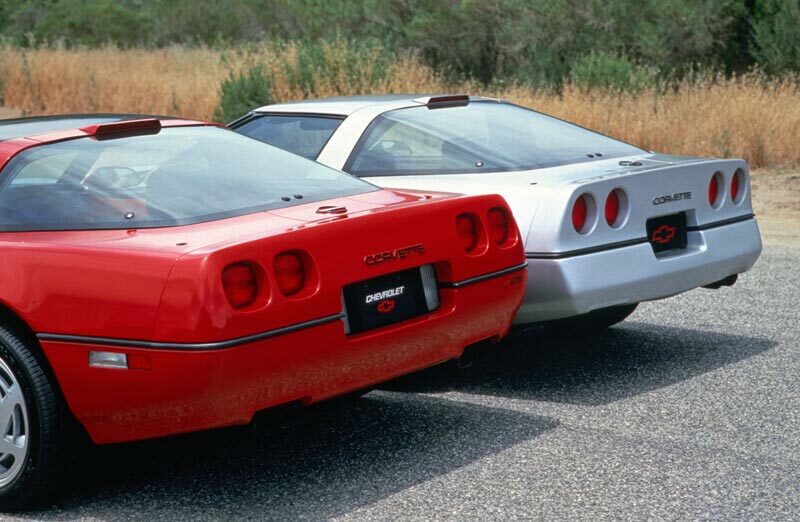 The stylists probably figured the back end would be the most common view other drivers would have of the ZR-1. 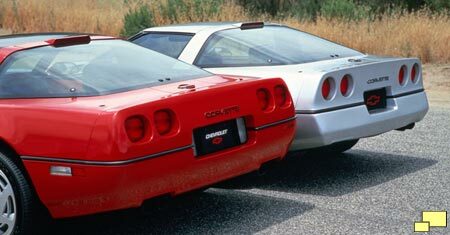 Right: Round tail lights had been a Corvette tradition since 1963, but the rule was bent for the 1990 ZR-1. 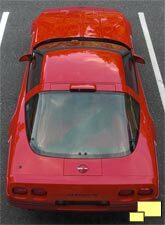 John Cafaro, Studio Chief of Chevy Three where decisions about the ZR-1 shape was made, said this about the square/round shape: "A designer is always trying to push, reach out there a little bit without losing the heritage of the car". 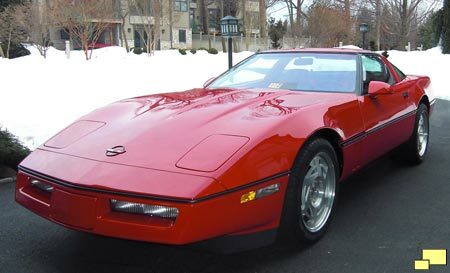 To competently couple all 375 hp to the ground, (below) the ZR-1 got 11" wide wheels (the L98 engine Corvettes had 9.5") with P315/35ZR17 B/W tires at the rear. 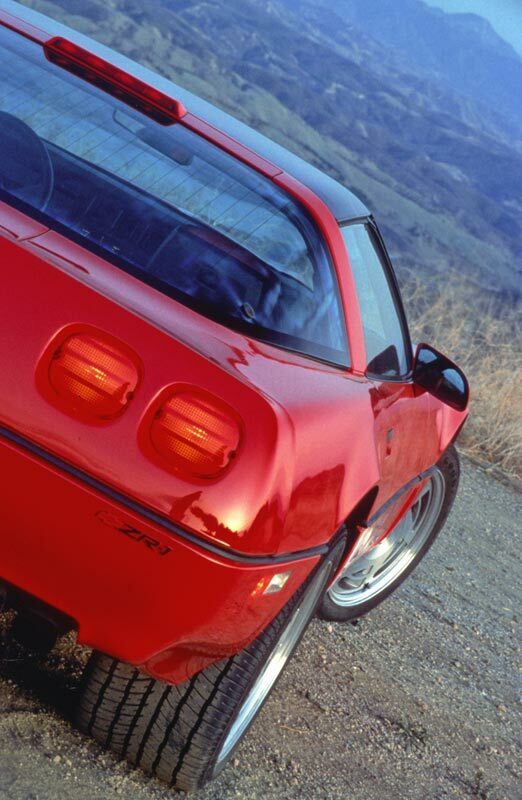 To accommodate the larger shoes, the rear of the ZR-1 was 3.0" wider. 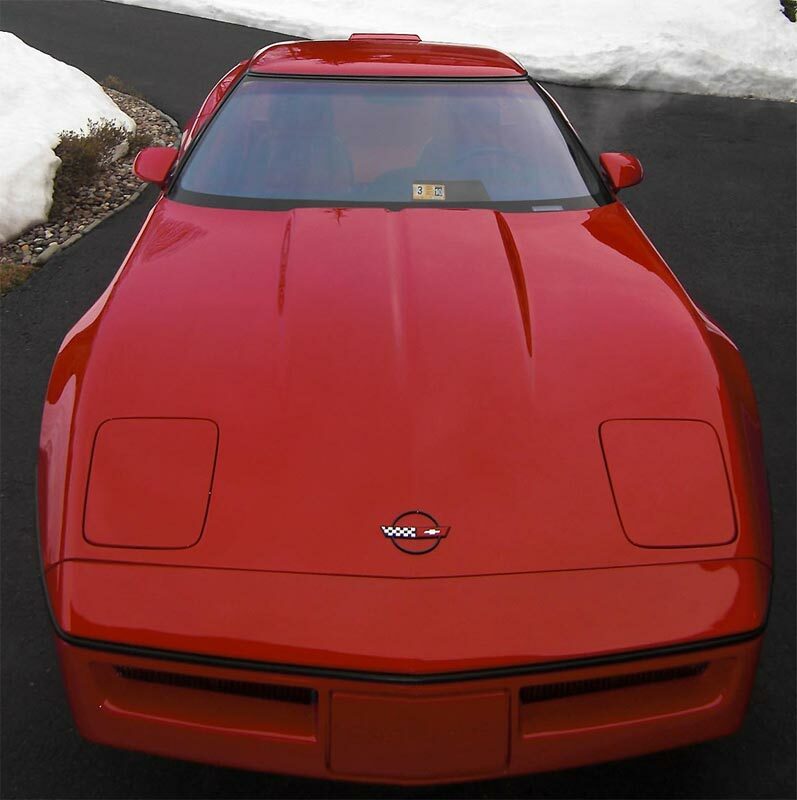 In addition to the rear clip, different doors and rocker panels were required. 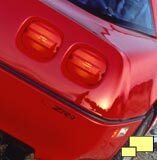 Some careful observing can reveal the differences - a clue is where the band that holds the rear of the Targa roof meets the body, as there is more horizontal area on the body of a ZR-1 at that point. 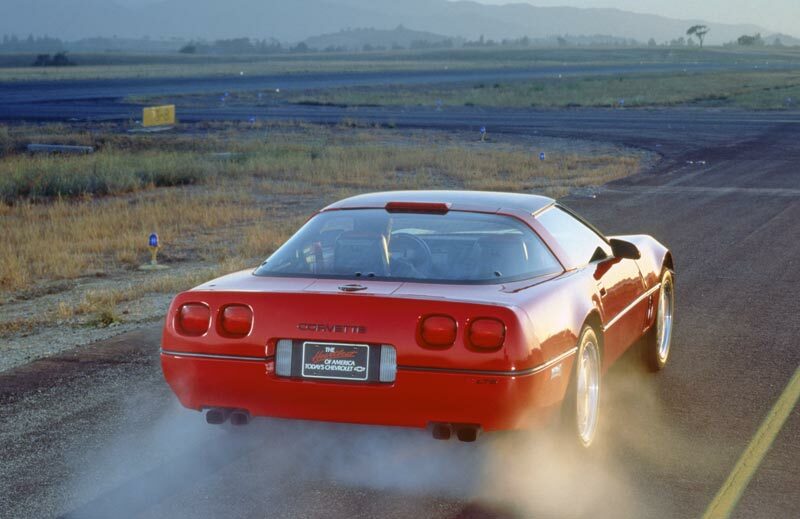 A set of eight very special ZR-1s was created when Corvette Tuner Doug Rippie and Gary Cline, LT-5 Project Engineer for Mercury Marine (the manufacturer of the ZR-1 engine) began exchanging the idea of modifying the engines for more horsepower. 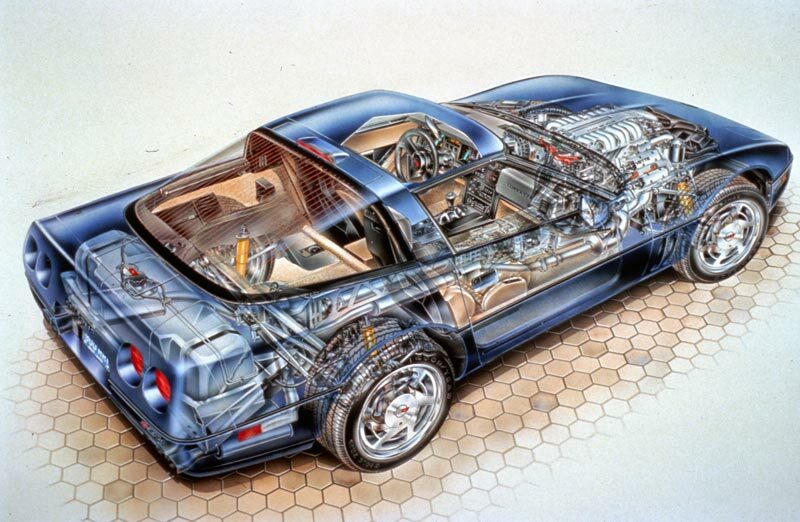 It was well known that the ZR-1 engine, initially rated at 375 hp, was capable of much more. A set of eight ZR-1s had their engines sent off to Mercury Cruiser for disassembly. 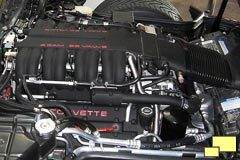 Racing style modifications, including complete port and polishing of the cylinder heads, injector housings intake plenums and the throttle body were performed. 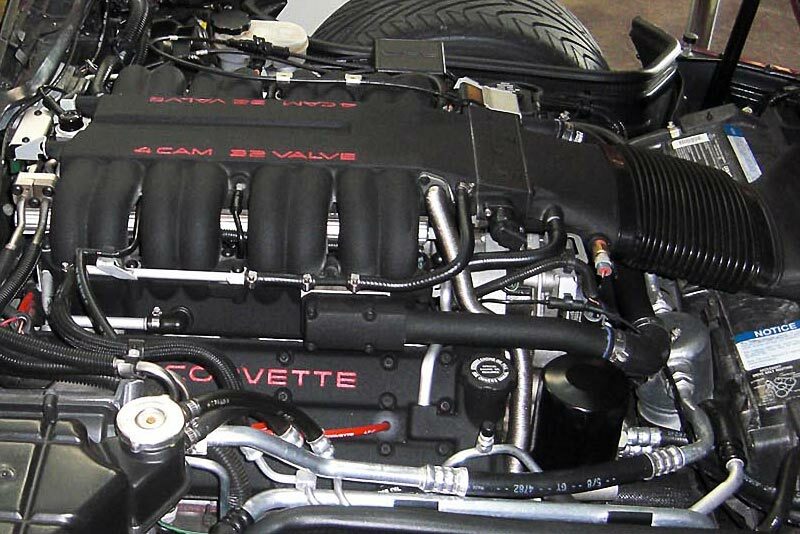 A custom camshaft installation and engine computer modification completed the engine mods. 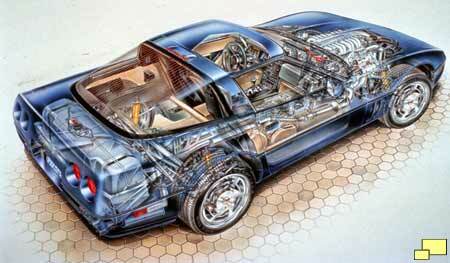 Outputs ranged from 405 hp to 450 hp, with some at 475 hp and one at 525 hp. Chassis modifications including suspension upgrades and Willwood brakes were performed on some of the cars. To distinguish the engines, a special black crinkle paint was applied. 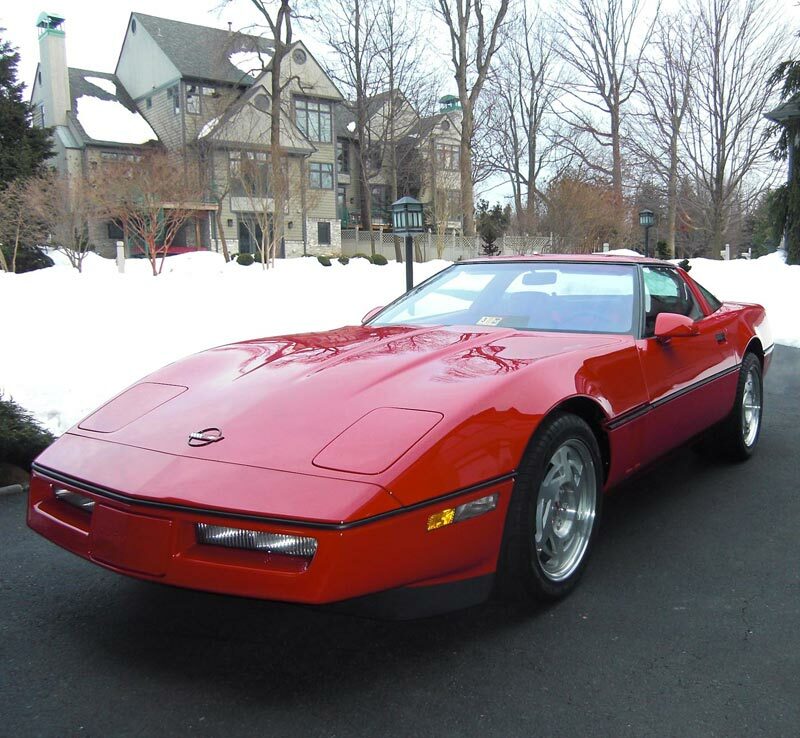 Combined with the red "4 CAM 32 VALVE" and "CORVETTE" lettering and the red spark plug wires one owner observed that it all looked like a black widow spider and the name stuck.